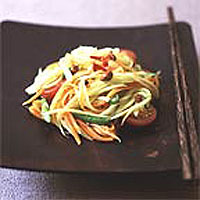 The papaya or mango needs to be almost crunchy, so find the most underripe example you can. Peel the papaya or mango, discarding any seeds. With a sharp knife, cut into julienne strips. Pound the garlic and chilli together in a pestle and mortar. Cut the green beans into short lengths and pound very lightly, just to bruise them. Put the garlic, chilli and bean mixture in a bowl. Add the sugar, papaya or mango, lime juice, fish sauce and tomato. Mix together. Serve sprinkled with chopped almonds.